Having sat unread on her shelf for the last half century, it deserves wider circulation, don't you think? There are not lulz or ♥s enough in all the galaxy for that cover! 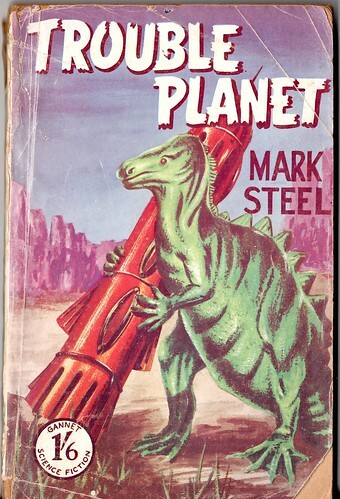 I'm assuming that Gannet Science Fiction is Penguin's little known SF imprint? They appear to have been an independent operation, with their own spiffy slogan: "Always look for the name - Gannet." That is a cool pic. I am assuming that the Mark Steel on the cover is not the same one who writes in the Independent and is a comedian as well. That is genius! Does it turn out at the end that the inhabitants of the rocket have actually been sucked backwards in time through a black hole, and it was Earth (in the time of the dinosaurs) all along? I am agog to learn! I see from the final paragraph that Kent and Loretta get together ("He knew that this time he had made no mistake"), but beyond that I wouldn't like to speculate. Ah - maybe they are in fact Adam and Eve, and their romance will ensure that they can now become the ancestors of the entire human race? That is delightful. The rocket looks just a little like a magic marker. I love the dinosaur's feet. They have that sort of blindly paddling lizardy quality. You're right! Very like a magic marker. In some earlier decade of my life, there was a ballpoint pen that looked exactly like that rocket. It had many colors of ink you could use, all in the same pen. Well. That does look like a pretty darn troubled planet, all right. Also, the dinosaur looks quite troubled. I think his left leg is bothering him. "We have to stop meeting like this!" Speaking of Lewis pamphlets, would you like a photocopy of A Cretaceous Perambulator? It arrived this morning, just as I was leaving for work - thank you so much!